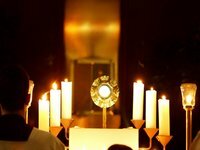 As part of my Lenten practice, I’ve decided to give one hour a week to something that deepens my spirituality; I plan to fill this one hour with attending daily Mass (I live shamefully close to a Catholic church for a Catholic that rarely attends Catholic service anymore), practicing Eucharistic Adoration, or volunteering. The following are some reflections I wrote in my journal after attending daily Mass for the first time on Thursday. I felt momentarily uncomfortable, as if she had caught me. Am I one of those people for whom she is praying? Have I truly stopped practicing my Catholic faith? Perhaps enough time has passed that Catholicism no longer needs to be something I push against. For so long, part of my Catholic identity was as someone who pushed against the system. I felt somewhat ambivalent about transitioning that identity to one of someone who had “given up” on Catholicism after all. And yet, being able to claim a second church home, in some ways, allows me to love anew my old one. I’m not trapped there anymore–now I visit freely instead. I guess it’s similar to how many adults feel they can love their parents better when they no longer live with them. Joining the UCC is a little like getting married–I have a new family now, and nurturing that relationship must take priority, but I don’t have to cut off all ties to my family of origin. Yesterday at Mass the thought crossed my mind that I was experiencing something of a love triangle, but I think the family comparison is more apt. Like in many other areas of my life, I was a “late bloomer” when it came to religion. I tried to be the “good girl” with all my prayers and rosaries and devotions and clubs during my adolescence and college years. My involvement with CTA called me into my rebellious years, although rather than instigate the rebellion, what it really did was give me support and community for something that was already there. And then, joining the UCC was analogous to “growing up” and “moving out.” It’s fitting that this paralleled my life journey in terms of when I married, too. And now I’m comfortable enough in my new identity not to feel swallowed whole when I return to the site of my childhood faith. I can return to Catholicism with renewed love and appreciation. I can keep it in my life. Even as I refused to “pick a side” in terms of my bisexuality, affirming that I could, indeed, be both “straight” and “gay,” so I will rest in this inbetween space when it comes to my faith, too. I will not choose. I will be both. And I hope that this year’s Lenten journey might help me illuminate just what such a balancing act might look like. This entry was posted in Spirituality and tagged Catholic identity, Lent, Lenten practices, spiritual practices by Lacey Louwagie. Bookmark the permalink. Thanks so much for this lovely reflection on attending mass– a place of comfort even if you don’t necessarily feel like it’s “home” anymore. Like growing up. Just lovely!